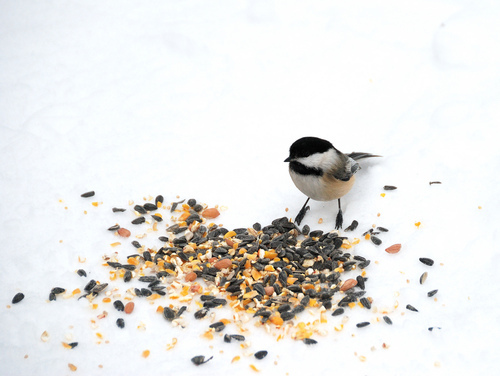 According to legend, if you sprinkle birdseed on your doorstep on New Year's Day, you'll have good luck in the new year. Happy 2012! Over Christmas I was rummaging and found this little DIY from years (a decade) ago. I think I had passed these out at a high school charity league meeting, not sure where I got the idea. Thanks to Google I learned this is a Scandinavian tradition. 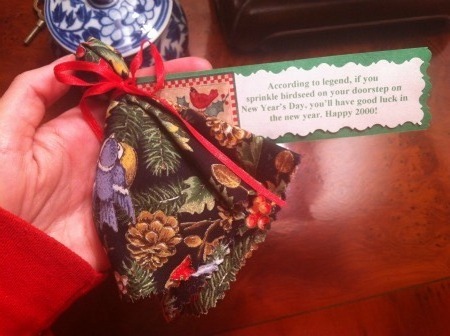 (Some say to sprinkle on your doorstep on Christmas... other say New Year's... I'll just stick with the latter.) Have you heard of this before? This post serves as a reminder for me to do it NEXT year... since it's a little late now. I thought it would be perfect for my colleagues at work in place of cards since it's non denominational. Just add your signature on the note. Self explanatory from the picture. Place a small amount of birdseed (about a tablespoon) in the center of a piece of fabric - gather and tie with ribbon. Punch hole in card with message and slide onto ribbon before securing. Lots of room for customization. You may find some festive bird fabric on sale now to save for the future project. Don't worry, I'll remind you next Thanksgiving so you can have them ready in time for holiday distribution. Oh my gosh--so cute!! I've never heard of this tradition before but I love the idea of spreading good luck! such a sweet gift for a New Years Eve party! Thanks for sharing! I'm with Rebecca on this one. I'm definately heading to Target for some serious birdseed.